Today, a friend of mine held a cook-out barbeque in their place, and so we drove up to their place and had a late lunch slash early dinner. A barbeque at around five in the afternoon. The occasion: another friend is leaving the area and moving to a different part of the state. After that, me and some friends went to a movie. We watched Mission Impossible 3. Ha! My first Tom Cruise movie in a number of years! I dunno, after the Cruise-Kidman break-up, I kinda boycotted his movies. I never watched The Last Samurai, even Mission Impossible 2 I didn't watch. But hey, it's 2006, let's give the poor guy another chance, eh? Didn't I tell you before that I went out the other day and took some pictures of the campus? I took some pictures to capture the picturesque scenery. Here are some. I won't be posting all the pictures in one entry, I wouldn't want to show it all only to have no pictures to show for the following days. 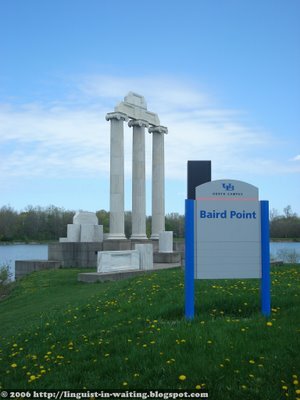 Here are a few photos of Lake Lasalle and the Student Park on the east side of the lake, plus UB's symbol, Baird Point. 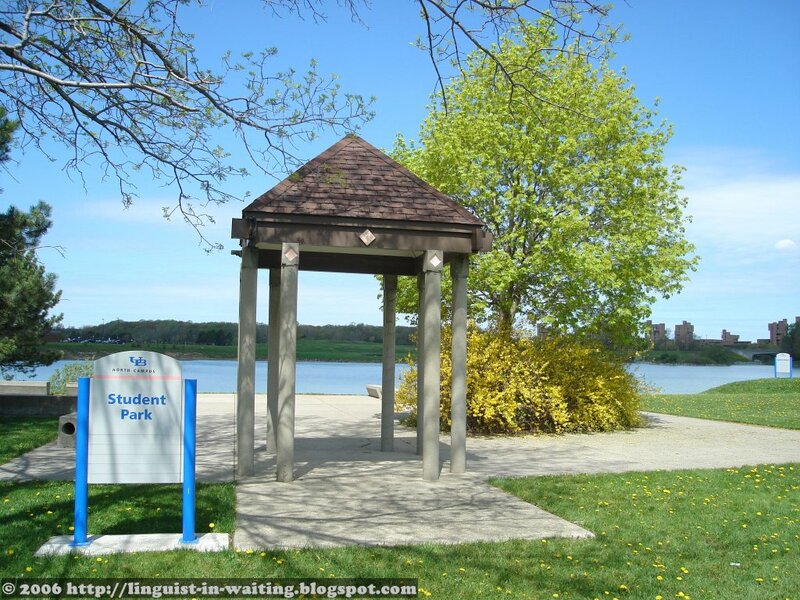 The Student Park is a serene place actually. It is behind the Alumni Arena (where my class next semester will be located at), and the Center for the Arts, where plenty of exhibitions are held. Some couples sit there, talk there, shoot the breeze there. Some bring their sketch pads and draw there. Some sit there, some meditate there. Some do their transcendental exercises there. Some do yoga there. Good stuff, if you ask me. This is Baird Point. 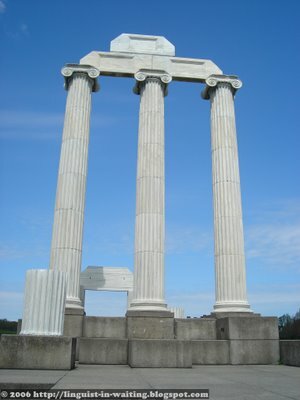 This is a protruding piece of land to the lake, where there are pieces of Ionic columns that just seem out of place. Yeah, architectural ruins in the midst of nature, eh? It's like they transplanted a piece of the Acropolis from Athens to Buffalo. Still, the effect is dramatic, especially at night, when it is illuminated by powerful spotlights. 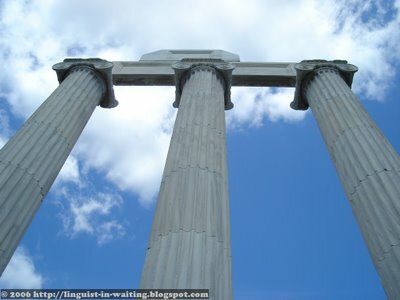 A close-up of the three columns. Notice the extra piece on the left-hand side. 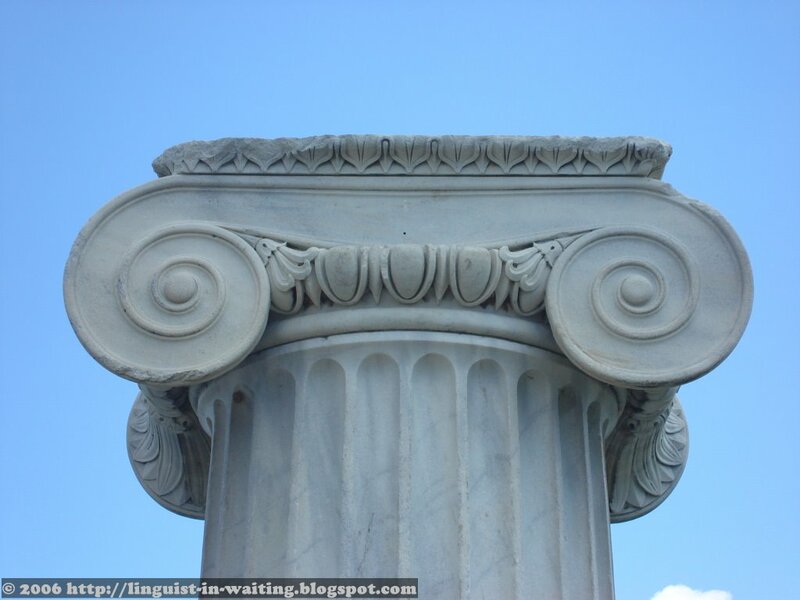 Obviously, this is not an old piece of marble. I don't know if they're trying to recreate an old feel to it, but the neatly shaped concrete platform doesn't do the trick. Either make it real old, or just make it look like it's brand new. Not something in between. Anyway, I am just being too picky. 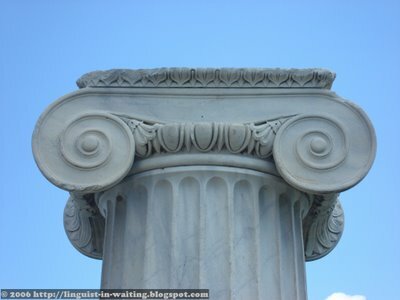 Finally, this is a close-up of one of the Ionic columns. Notice the chipped part of the right-hand side loop. Oh well, that's my photoshoot for you. I'll post the photos of the other parts of the campus in another entry to follow. Wow, really very nice photos!!! Composition, colors and light are great.